Having just marked 50 years since the publication of his first railway photograph, John H Bird recalls his photographic documentary of the decline of Southern steam on British Railways. NEW Year’s Day 1966 was a glorious winter’s day with a cloudless sky, bright sunshine and (best of all) Southern Region steam parading in front of me. ‘WC’ No. 34034 Honiton at Southampton Central’s platform 2 on January 29, 1966, with the 10.55 Plymouth- Brighton service. It was steam worked in the winter of 1965/1966 through from Salisbury, alongside ‘MN’ No. 35008 Orient Line taking water, while working the 13.30 Weymouth-Waterloo. My location was the cinder path that ran parallel to the Bournemouth main line at Southampton Central to the next suburban station at Millbrook. My reason for being there was to photograph the unusual sight of a non-stop passenger train passing through Southampton, the LCGB’s ‘Mendip Merchantman’ railtour, bound for the Somerset and Dorset, which was scheduled through at 10.03, but duly emerged about 13 minutes late, hauled by a very clean Bulleid ‘Merchant Navy’ No. 35011 General Steam Navigation. I was even more excited by the arrival of an equally clean ‘U’ 2-6-0 No. 31639 with a short passenger train, which it shunted into bay platform No. 5. These locals to Bournemouth were invariably in the hands of grubby ‘Standards’ by this time, so to have a Maunsell Mogul turn up was a real bonus. My timetable told me that the ‘U’ was booked to wait for the arrival and departure of the 08.35 from Waterloo to Bournemouth. Soon, a reasonably clean, but nameless, ‘West Country’ No. 34021 Dartmoor rolled into platform 4 and the fireman jumped up on the tender to drop in the water bag, while the driver turned the control wheel of the water column. I was so engrossed by the scene that I was caught by surprise as a begrimed ‘West Country’ clanked into the scene from the west. It was No. 34018 Axminster (still carrying nameplates as far as I could tell) leading a string of maroon carriages. The two white headcode discs above the buffers were the clue that this was the ‘Pines Express’, heading for the Western Region and then the north. Suddenly three steam locos were in the picture, and what I failed to grasp at that moment was that this was actually the last scheduled steam-hauled ‘Pines’, so making it an historic cameo. The other subsequent discovery was that the ‘U’s’ unexpected appearance was to move it to Bournemouth ready for its role in another railtour over the Somerset & Dorset the following day. The reason that two tours were making for the S&D on consecutive days was that it had originally been planned to withdraw all passenger services between Bath and Bournemouth with effect from January 3, 1966. However, last-minute delays in licensing alternative bus services bought a three month reprieve, but the planned tours ran anyway. This was very much to be the theme of 1966 – closures, last runs, dwindling steam classes and plenty of rail tours. I was looking forward for weeks to the programme of specials planned for January. The December 1965 Railway Magazine referred to five potential railtours traversing the Southern region, and indeed five did run, although not quite as advertised. Naturally, I wanted to see all five, but as a schoolboy my pocket money and my age limited my participation opportunities. If I had been old enough to drive I would have been able to chase the two S&D railtours on the first weekend of January. In reality I was limited to travelling by my bike and by train (taking advantage of ‘priv’ tickets thanks to my dad being employed by BR). The sparse service of passenger trains over the S&D was a major problem for train chasing so I was left just to imagine what was taking place. On the LCGB tour, No. 35011 (making a possibly unprecedented visit by a ‘Merchant’ to the southern section of the S&D) handed over to Ivatt ‘2MT’ tanks Nos. 41307 and 41283 at Templecombe for the section to Highbridge. The tour was then taken on by Bristol Barrow Road’s ‘9F’ No. 92243, which made for Bath Green Park via Bristol Temple Meads. Unfortunately, the 2-10-0 failed at Warmley with a reported collapsed brick arch causing a 90-minute delay waiting for rescue. No. 92243 was due to be withdrawn anyway at the end of the following day, along with all other non-S&D-based WR steam locos. The tour was rescued by one of Bath Green Park’s three LMS ‘8Fs’, No. 48760. From Bath to Templecombe No. 48760 was joined by No. 48309, making a powerful combination. It was still not enough to keep time, but by omitting a planned stop for water at Evercreech, a few minutes were recovered overall. ‘MN’ No. 35011 did the final leg back to Waterloo, reached some 75 minutes late. The next day the RCTS did its version of the ‘S&D Farewell’. Again, No. 35011 took the lead from Waterloo, but only as far as Broadstone. There, it handed over to the aforesaid Nos. 31639 and 34015, which did the entire length through to Bath. ‘8F’ No. 48309 then returned to action to work to Highbridge via Bristol and the WR main line, and then the previous day’s two Ivatt tanks reappeared to work along the branch to Evercreech and then Templecombe, to give way yet again to No. 35011 for the last leg. From the following day the normal service over the S&D was decimated, with only a few trains scheduled and inconvenient connections, providing no more than a nominal service pending closure enactment. However, it did mean that the WR’s aim of ridding itself of all steam traction was thwarted and Bath Green Park depot and Templecombe soldiered on for another two months until final closure on March 6. For the second weekend of January, I was able to be more active with my camera. My first target was to head for the Salisbury area to photograph the special that was booked to run over steam-banned WR territory right through to Exeter over the old Southern main line, which had been monopolised by WR diesels since September 1964. The ‘Last Steam Train to Exeter’ (well the first of five such ‘last runs’ as it turned out!) was privately organised by Messrs Winkworth and Bloxham, and promised fast running as well as a nostalgic farewell to steam into Devon. The haulage was shared (appropriately) by ‘WC’ No. 34001 Exeter from Waterloo to Salisbury via the Portsmouth Direct Line and No. 34015 Exmouth ,which was in absolutely superb external condition. Although Exeter kept good time to Salisbury, Exmouth struggled with a very ambitious 87-minute, non-stop plan for the 88-mile run to Exeter and dropped 10 minutes en route. The weather was the complete opposite of New Year’s Day and it was fortunate that No. 34015 was so well polished to shine out in the gloom. I didn’t bother to see the return journey, which was in the dark anyway, but apparently it was a similar story to the outward journey. No. 34015 lost time all the way up from Exeter, missing out on its tight 86-minute booking by nearly 15 minutes. Again, No. 34001 outshone its unmodified classmate and reached Waterloo pretty well in the scheduled 88 minutes. The next day was really special for me and many other enthusiasts. As the highlight of the month, the LCGB had promised to rejuvenate a proper ‘Southern’ locomotive; an ‘S15’, for a final run, even though the class had been officially eliminated by withdrawal the previous September. The date was planned for January 16, but such was demand that a duplicate run was added for January 9. The bike and local trains was put to good use again to see the aptly titled ‘S15 Commemorative’ railtour, which not only gave the beautifully turned out No. 30837 a fitting finale, but included the reappearance of No. 31639 taking the tour for a little excursion down the freight-only Bentley to Bordon branch. Once again it was a beautiful sunny day, and by the use of local Hampshire DEMUs (‘Thumpers’) to Alton and then a Waterloo-bound 2-Bil EMU, I was able to get to a position where the Bordon line diverged at Bentley for a pleasing shot of No. 31639 in action. Later, I used the local services to get to Alresford before the ‘S15’ reappeared for a photo-stop. The tour went on to visit Eastleigh Works and the participants and many others (!) joined in to bunk the shed as well. No. 30837 returned to London via Fareham and Guildford, and was obviously in fine fettle, keeping on or ahead of schedule with speeds around 70mph noted during the day. The following Sunday (January 16) happened to be my birthday, and I couldn’t have hoped for a better day than another bash chasing the ‘S15’. However, this time the weather remembered it was supposed to be winter and so there was steady snowfall and consequent disaster for my dreams. The local DEMU services were running very late, so I missed my connections and any hope of getting to Bentley again. Thinking on my feet, it seemed the best I could hope to do was to get off at Winchester – my only hope of seeing the down working. On arrival I made for the Andover Road bridge, but for some unaccountable reason I took the wrong turn. As I walked and ran in a bewildered state trying to find the overbridge, I heard a whistling that could only have been the special passing a few blocks away. I was very angry with myself and would have been even angrier had I known that the special was being double-headed this time, No. 31639 having been coupled inside the ‘S15’ for the ascent of the snowy ‘Alps’ to Medstead, a wise move given the conditions. So back to Winchester station and at least a pleasant shot obtained of ‘Battle of Britain’ No. 34059 on a down semi-fast, which took me to Eastleigh, where the ‘S15’ tour was stopping for a while. As on the previous Sunday, ‘USA’ class No. 30073 hauled the tour right into the works yard so the participants (and many more) could easily make a visit before heading across Campbell Road to the engine shed, which was effectively ‘open house’. In the works was GWR 2-8-0 No. 2818, waiting to receive a makeover for preservation, along with a few Bulleids and Standards under repair. Again, many like-minded souls took the opportunity to bunk the shed, the locomotive residents being much the same as the previous Sunday, several SR Moguls and ‘Merchant Navy’ No. 35004 Cunard White Star, each waiting their journey to the scrapyards. Also on shed was ‘M7’ No. 30053, prior to its export to the USA: no one could have foreseen that 50 years later it would be back in the UK performing regularly at Swanage, a line which in 1966 was still going strong with steam haulage, under British Railways ownership. Another interesting sight at Eastleigh MPD was Standard ‘2MT’ No. 84014, dumped at the back, the first time one of the class had been on the Southern since 1961 when the Region’s fleet of 10 had been transferred to the North West. No. 84014 had reached Eastleigh a few weeks earlier, having travelled in steam from Stockport. In theory it was one of 10 class members being considered for service on the Isle of Wight to replace the ageing ‘O2’ tanks. However, this was only a paper transfer for the other nine were all scrapped in the North West without travelling south because in the meantime the decision had been taken to electrify the Isle of Wight line, leaving the ex-LSWR ‘O2s’ to soldier on until the end of 1966. No. 84014 was later despatched to Cashmore’s scrapyard in Newport. It is pleasing that two similar Ivatt ‘2MTs’ will secure the future of steam on the Isle of Wight after all, with No. 41298 already restored at the time of writing, and No. 41313 due to follow in a couple of years, to become the workhorses of the preserved Isle of Wight Steam Railway, based at Havenstreet. With No. 30837 off on its final journey to Waterloo (and a faint hope that it might end up in preservation, as it was stored optimistically at Feltham until going off to scrap in July) it had to be faced that British Railways Southern Region’s steam days were coming to an end. The SR started 1966 with an official allocation of just 212 locomotives in capital stock, and a further six locomotives in departmental service, together with the 14 ‘O2’ tanks left on the Isle of Wight. 16 ‘Merchant Navy’ class, and 14 unmodified and 40 modified Light Pacifics. Pre-Nationalisation Southern steam was now pretty thin on the ground on the mainland, with just six ‘N’ and four ‘U’ Moguls clinging on at Guildford, where the last three ‘Q1s’ were also based; although two of these were officially condemned in the first weeks of January they remained active for a few more weeks. In truth the last months of Southern steam were to be dominated numerically by the 120 BR Standard locos in the 73, 75, 76, 80 and 82 number ranges, although it was the Bulleids which were to be the stars of the final show. SR steam was by now confined almost entirely to the former LSWR territories, excluding of course the section west of Salisbury, which had succumbed first to WR control and then downgrading and route reduction and dieselisation in 1964. However, the passenger services from Waterloo onwards to Southampton, Bournemouth and Weymouth were pretty well 100% steam operated in January 1966, hence the epithet ‘Britain’s last steam-worked main line’. In addition, some peak-hour Waterloo to Salisbury services remained steam worked, as well as various local passenger turns from Basingstoke to Salisbury, and to Bournemouth and Weymouth. The Lymington and Swanage branches remained steam worked with Ivatt or Standard tanks in control, and the same was true for the unadvertised Clapham Junction to Kensington Olympia peak-hour shuttles. Much freight working on the region was handled by ‘Cromptons’ (the BRCW Type 3 Bo-Bo diesels in the D65xx series subsequently known as Class 33), but as they were only capable of electric heating they did not do passenger work in the winter. The lack of electrically heated coaching stock also explains the bizarre survival of steam working on the eastern section of the daily through service between Brighton and Plymouth. At various times in previous years the section across the central division, westwards from the Portsmouth area to Brighton, had been electrically hauled by one of the three Southern Railway electric locomotives (Nos. 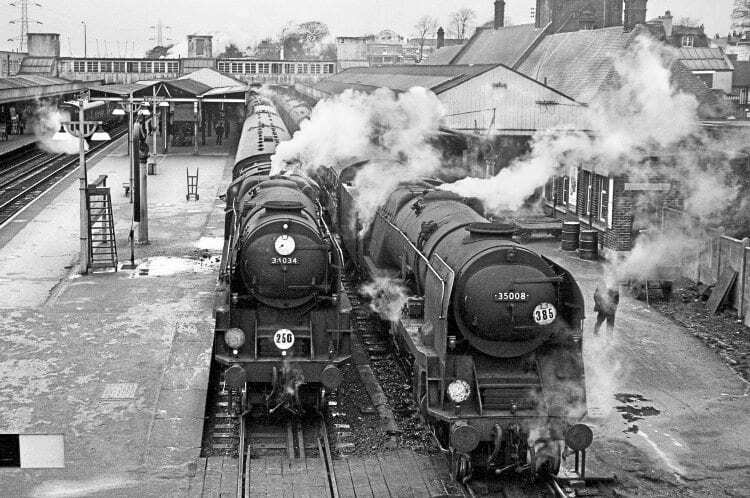 20001-20003), but for the winter of 1965/1966 steam returned, working through from Salisbury to Brighton. As the SR’s central division was essentially a steam-free zone and there were limited or no servicing facilities available at Brighton, the allocated loco was based at Fratton overnight and had to do a major stint of light engine running to and from Brighton each day. The working not only brought a welcome daily dose of steam to Brighton and the coastal line, but also formed the only steam-worked passenger service across the ‘Thumper’-dominated Salisbury-Southampton-Fareham/Portsmouth route. Otherwise there were just a few daily steam workings over portions of the line by parcels and daily goods trains, apart from a few interesting nocturnal workings of mail and newspaper trains from Waterloo to Portsmouth and a couple of peak-time extra workers’ trains between Eastleigh and Portsmouth. So, January 1966 was the beginning of the end, but it was to be an interesting and at times exciting sunset for Southern steam, which would finally end when ‘Merchant Navy’ No. 35030 rolled into Waterloo in the afternoon of Sunday, July 9, 1967 with the last steam-worked passenger train, the 14.09 train from Weymouth, while a few hours later, ‘alien’ Standard ‘3MT’ Class No. 77014 performed the very last working of all, right at the other end of the line, hauling a late-evening van train from Bournemouth. Like many others I look back with nostalgia to those days when Southern steam finally surrendered! Read more Features and News in the April issue of The RM – on sale now!